New teachers may be staying longer in the education field than in the past, according to a new analysis. About 70 percent of beginning teachers are sticking with the profession for at least five years -- in both high-poverty and low-poverty schools, according to researchers Robert Hanna and Kaitlin Pennington of the progressive think tank Center for American Progress. Their analysis contrasts with previous research, which found that 50 percent to 60 percent of new teachers stick to the field for at least five years. The CAP researchers say in a paper released Thursday that previous research relied on older data. Hanna, a CAP senior education policy analyst, told The Huffington Post that his research should serve to update previous studies, not dispute them. Still, Hanna said he doesn't know why the number of new teachers staying with the profession would surge and doesn't speculate on the reasons. Hanna and Pennington used data from the U.S. Department of Education's the Schools and Staffing Survey from 2007 and 2008, and a follow-up survey called the Beginning Teacher Longitudinal Study, as well as the Schools and Staffing Survey from 2011 and 2012 and its recent follow-up. 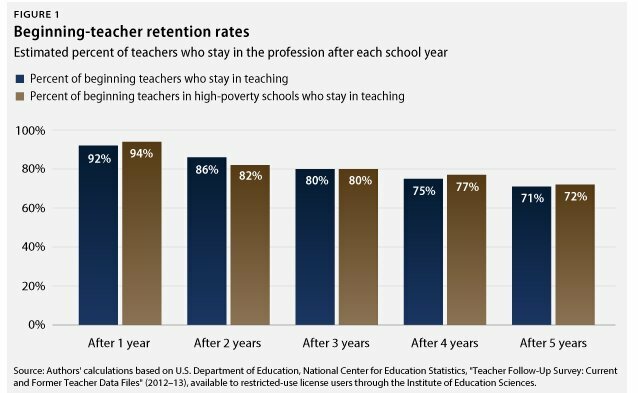 The researchers replicated the statistical method used by Richard Ingersoll, an education researcher who previously estimated retention rates of 50 percent to 60 percent for new teachers. This material was published by the Center for American Progress (online).